One thing I love about running is that I finally have a good pair of calves. I never had that. I always had thin, skinny calves. And I love shapely calves on a woman. I think mine are perfect now; not too much, but just enough to balance out the fact that I have thighs. The alternative is carrot-legs. But the 401km I ran on these running shoes are showing in my calves. Having calves also means that I can finally wear boots. I'm not talking about the saggy type that I've been wearing; or ankle boots... I'm talking about the kind of boots I see loads of other women wear. And today I bought myself a pair of boots. See? 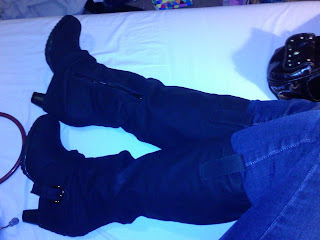 I know it sounds shallow, but to me being able to buy normal boots feels like an accomplishment.